Ten-man Bayern Munich ended their four-match winless streak on Saturday as Robert Lewandowski scored twice in a 3-1 win at Wolfsburg, a day after the club's hierarchy launched an extraordinary attack on the German media. After back-to-back league defeats, Bayern leapt from sixth to third in the Bundesliga, four points behind Borussia Dortmund who routed Stuttgart 4-0 with Paco Alcacer claiming his seventh goal in four Bundesliga games. 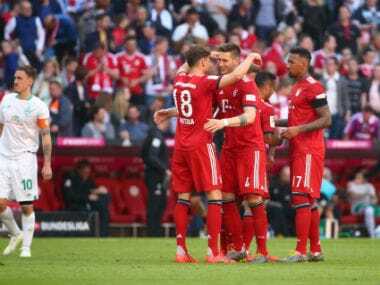 Bayern got back to winning ways in Wolfsburg the day after chairman Karl-Heinz Rummenigge and president Uli Hoeness slammed the media in Germany for "disrespectful and disgusting" reporting on star-studded Munich. Bayern worked for the win, playing the last half an hour with ten men after Arjen Robben was sent off after receiving two yellow cards. "There was a lot of pressure on this game and I want to thank the boys for a top performance," said Bayern head coach Niko Kovac. "It was a very concentrated display. 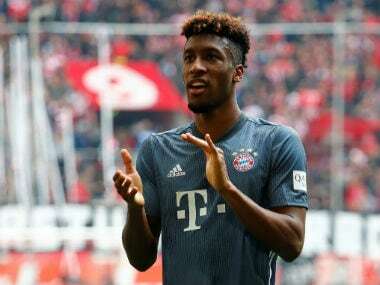 It is the first step and showed that FC Bayern can fight back." Lewandowski gave Bayern an early lead when he tucked away Thiago Alcantara's dummied pass past Wolfsburg goalkeeper Koen Casteels. It was the Poland striker's first goal after drawing blanks in his last five games for club and country. With half-time approaching, Robben earned his first booking for a dive in the area before Lewandowski struck again just after the break. The Polish striker latched on to William's misplaced back-pass and dribbled around Casteels to poke his shot into an empty net to make it 2-0. Wolfsburg pulled a goal back five minutes after Robben's dismissal when Dutch striker Wout Weghorst buried the hosts' first clear chance. James Rodriguez calmed any nerves in the Bayern ranks with a stunning shot inside the post 18 minutes from time. In Stuttgart, Dortmund remained three points clear after their attack of Jadon Sancho, Marco Reus and Alcacer ran riot with the trio all claiming first-half goals. Before kick-off, Dortmund's sports director Michael Zorc revealed Borussia are set to make Alcacer's loan stay from Barcelona permanent. The Spaniard demonstrated why with his 11th goal this season for Dortmund and Spain to become the league's joint top-scorer. Fresh from making his senior England debut, Sancho, 18, put Dortmund ahead on just three minutes when he fired home after Reus' shot was deflected into his path. Reus then made no mistake with his second chance for his fifth league goal of the season. Alcacer made it 3-0 after 25 minutes when his sublime chip beat the Stuttgart goalkeeper. The hosts tightened their defence after the break, but Dortmund deserved the win as Maximilian Philipp slammed home their fourth six minutes from time. "That was a big start from us, coming back from the international break," said Sancho. "We came out sharp and I was happy to be able to get the first goal." Werder Bremen later went second in the table, knocking Bayern down to third, after midfielder Maximilian Eggestein scored either side of half-time in their 2-0 win at Schalke. Elsewhere, England junior international Reiss Nelson, on loan from Arsenal, scored twice as Hoffenheim warmed up for their Champions League game at home to Lyon with a 3-1 win at Nuremberg. RB Leipzig are fourth after a goalless draw with Augsburg cost them a fourth straight win. Brazil defender Felipe was Hanover's hero, then villain after scoring their second goal, but was then sent off in their 2-2 goal at Bayer Leverkusen, whose Karim Bellarabi scored a late equaliser. On Friday, Serbia striker Luka Jovic, 20, became the youngest player to score five goals in a Bundesliga match as Eintracht Frankfurt romped to a 7-1 win over bottom side Fortuna Duesseldorf.